Man has not always lived under the law: in primitive cultures and tribal communities it was the norm for people to use reconciliation sessions to resolve disputes or decide on retribution. Gradually, with human development, societies began to form legislation to ensure justice and coded systems of welfare. In Egypt, however, where exceptions are often the norm, reconciliation sessions have gained notoriety as far as sectarian crimes are concerned. Watani’s recently published book Reconciliation Sessions and Copts: Where the Culprit Emerges Triumphant and the Victim Crushed, documents 19 outrageous sectarian crimes—the vast majority of which ended in ‘reconciliation’—that took place since the beginning of the third millennium. In his introduction to the book, Nabil Abdel-Fattah of Al-Ahram Centre for Political and Strategic Studies, describes it as a “book of pains”. He stresses that the accelerating rate of incidents of violence against Copts represents a flagrant blow to political and constitutional values in Egypt. Mr Abdel-Fattah treats the reader to a brief history of the Coptic predicament in the 20th century, in an attempt to elucidate the reasons behind waiving the law in favour of reconciliation sessions. He concludes that the current policy of resorting to outdated traditional means as a substitute to the modern civil State and its institutions is an indication of a severe regression in the modern political mindset. He sees the book as a final, imperative call to uproot the causes of sectarian violence and re-institute civil law and the tenets of the modern State. For his part, Mounir Megahed, founder and head of the Egyptians Against Religious Discrimination (MARED) movement, wrote his “Testimony” on the topic, citing cases which MARED had strongly condemned at the time they occurred, and denouncing the pressures commonly applied against Copts to force them into ‘reconciliation’. In some 100 pages the book reviews how the security apparatus in Egypt chooses to ‘reconcile’ the culprits and the victims in crimes where churches are burned; Coptic property and homes plundered, and Copts themselves assaulted, beaten and sometimes murdered; and when even monks are not spared. Even though it stands to reason that such cases should be seen in courts of law where the culprits would be handed fair sentences, this is almost never allowed to take place. And even in the few cases which managed to find their way into the courts, the culprits were never handed fair sentences since the police invariably fell short of providing any incriminating evidence against them. The farcical scenario of reconciliation sessions has thus without fail dominated the scene where attacks against Copts are concerned, even though these sessions proved to be nothing but a severe retreat of civil rights. Politically speaking, the authorities aim—through the reconciliation sessions—to secure a rosy façade of the ‘time-honoured amicable relationships between Muslims and Copts’, implying that they live happily ever after. The heartbreaking outcome, however, is that the only winners in these sessions are the trouble mongers and fanatics who induce the attacks in the first place and who more often than not escape punishment and emerge victorious. The Coptic victims are left to lick their wounds. But what is it that makes the Copts accept such humiliating defeat even though they are very obviously in the right? This is the question the book attempts to answer. 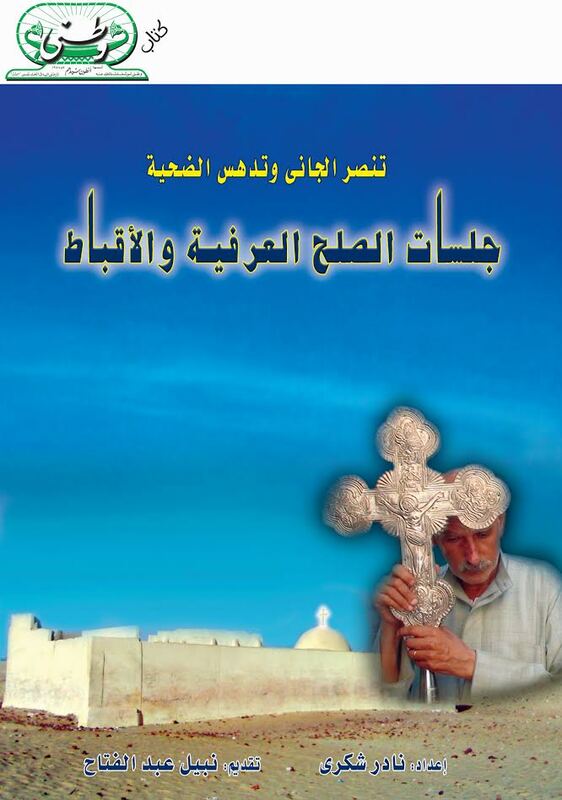 The book looks at several major incidents of vicious attacks against Copts in the Delta and Upper Egypt, where the law was set aside in favour of suspect ‘reconciliation’ which invariably ended in further crushing the Copts. On 10 February 2002 the congregation attending the first Mass of their newly-built and licensed church at the village of Beni Walmas in Minya was surprised by a Muslim mob hurling stones at them once the bishop began to conduct the service. The mob climbed the church steeple, pulled out the cross and hurled it on the ground. The church was destroyed and burned, as were 13 nearby houses. The police caught and accused 50 people, but a few days later all were released on the grounds that the mob was a group of youngsters who did not realise what they were doing. The local authorities orchestrated a reconciliation session which the Copts had to agree to lest they be accused of inciting hatred and animosity among their Muslim fellow villagers, thus escalating the violence. It did not help that justice had been defeated and no culprit was penalised. When a rumour circulated in the village of Bemha in Ayyat, Giza, in May 2007 claiming that a Copt was building a church on his private piece of land—in fact he was only building a house for his son—more than 2,000 Muslims gathered after Friday noon prayers, destroying and burning whatever they could that belonged to Copts. The losses were 35 houses and shops, as well as burnt fields and many people were injured. So why did the Copts agree to sit at a reconciliation session? They did so because there was no church in the village, and they had to travel a very long distance if they wanted to pray or conduct a marriage or funeral ceremony. The deal was that if they withdrew their complaints, they would be given a permit to pray not in a church, but in an ordinary building. The building was to have no steeple, no dome, and no cross. If not the Copts were threatened that the sons of the culprits who were then detained would take revenge. Sadly, they were forced to agree to these terms. The only incident when Copts were known to be compensated was in Esna in 2008, where similar sectarian violence had occurred but the Pope insisted that no reconciliation would take place unless the victims were paid for their material losses. Nevertheless, the people had to withdraw their cases against their assaulters in order to receive compensation. In one of the most notorious cases of reconciliation, a Coptic extended family of some 25 members in the village of Higaza Qibli in Qena, Upper Egypt, was forced to remain in a mud-brick hut they owned and used as a stable for some four months in what amounted to house arrest. They finally agreed to ‘reconcile’ with the Muslim family against which they held an ongoing vendetta in exchange for—nothing. “All we want,” the head of the family said, “is to put an end to the intolerable pressure which is being exerted by the security authorities on us.” And of course, no pressure whatsoever had been applied on the Muslim family. In several other cases the police is known to have detained innocent Copts to use them as bargaining chips and force the Coptic community to accept reconciliation. This was the case in, among others, Ezbet Basilious in July 2009 when a newly built church was burned and the Coptic neighbours who had donated the land for the church were accused of setting it on fire, and in the notorious case of Abu-Fana monastery in Minya in 2008. In May 2008 the fourth-century monastery was assaulted by nearly 60 Muslim “Arabs”—as the tribal desert dwellers in Egypt are called—who set the monastery ablaze, opening fire on monks and abducting three of them. They tortured their captives for about nine hours in an attempt to force them to convert into Islam. Despite such gross crimes, the monks were forced to give up all their rights so as to guarantee the release of two Copts who had been imprisoned for 13 months standing on a trumped-up charge, and who the security authorities refused to set free—claiming a security precaution—despite a court order. Justice has no place in reconciliation sessions, as the book clearly reveals. They are one of the many facets of corruption which lurk deep in many of Egypt’s institutions, and they need immediate reconsideration and immediate reformation.